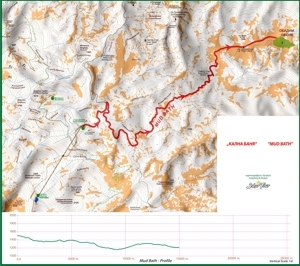 Please note the PDF map is only of the off road section above Obidim. I consider the trail the whole ride from Bansko via the off road section back to Bansko. The URL link gives the whole trails as I see it. Mud Bath is an almost perfect example of what I like about cycling. A good climb up the tarmac road, 15km with 400m of altitude gain. 13 km of fast forest track with plenty of up and down to keep it interesting. From Obidim there is a 10 km descent on the tarmac where you lose 600m of altitude. Finally a 17km grind back to Bansko with 300m of altitude gain. The whole trail is about fitness more than technical skill. When the legs are feeling good and there is plenty of fuel in the tank you can just power round this great little course. N.B. There is a turning at 25km to the right which leads off the main track into the wilderness. This trail takes you down to the main road via a dirt track . thus you can swap 10km of road for 10km of off road. I haven’t marked this track but it is worth looking into! Maybe hire a guide for that one.